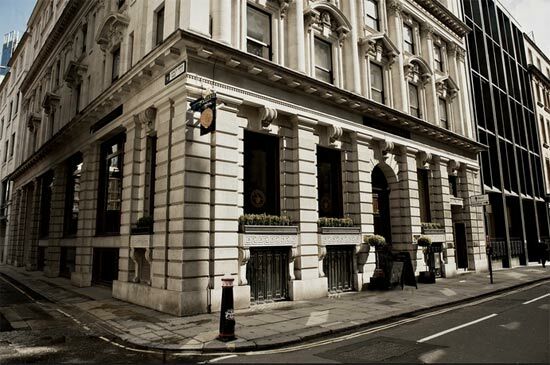 Situated on Moorgate at the junction of King's Arms Yard you will find The Tokehouse, a modem pub style which Fullers have found works well in the City of London, Shaw Booksellers, The Vintry and the The Telegraph being other examples. The Tokenhouse offers a bar and restaurant on the site formerly known as Bluu. The menu of British and Mediterranean dishes includes Langoustine risotto, lamb shoulder pie with mask & greens and Fish & chips. The name Tokenhouse comes from 'token house' which was located just at the east end of King's Arms Yard and dates back to about 1635. Tokens were the small change coins given to customers by traders prior to the introduction of halfpenny and farthing coins. Originally these metal discs were produced by the traders themselves and bore a trade sign or emblem for identification. The advantage to the small time business man was that these coins could only be exchanged for goods at the issuing shop - a kind of forerunner to modern day gift or book vouchers. Tokens were officially withdrawn from circulation in 1672 on the introduction of low denominational coins of the realm.